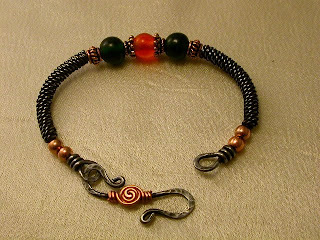 This is one of my favorite twisted coil "noodle" bracelets that I have made, it is mild steel or black wire as I call it, with copper accents and dark green and orange glass beads, hand hammered S clasp with a copper doo hickey decoration on the clasp.. this wire gets Hard with working it... but I do love the steel wire, coils have been buffed to remove some of the dark layer and expose the wire color underneath. It looks very much like a Hematite sheen, Very Goth looking... and as I am kinda Goth I really like it! This fits perfectly on my 6.5" wrist and might fit a 7" if you would like it, 20.00 plus 2.50 shipping (bubble mailer) and insurance is you want it.